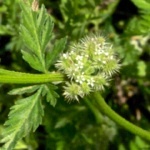 An elusive little plant on Skopelos, knotted hedge parsley, Torilis nodosa, is usually found growing amongst other white flowers plants of the Apiaceae family, especially Scaligeria napiformis. The species name, nodosa, refers to the placement of the flower clusters at the nodes of attachment of the leaves, giving it a knotted appearance. 1. The Names of Plants. David Gledhill. Fourth Edition. Cambridge University Press.